Establishing an eCommerce website is a must, if you have long-term aspirations and intention to start selling online. A quality web store will help you reach several goals at a time. It will become the top notch destination for users looking for the services/products you are selling. It will also provide detailed information about the product assortment and variety of shopping options you offer. This is also the major source of contact information potential and current users might wish to find out. Despite the impressive amount of affordable possibilities for eCommerce websites, many of them eventually prove to be ineffective. Fortunately, there are services, which make it possible to create a decent website on your own and within the shortest time interval. Let’s find out more about them now. To solve the problem, we have decided to come up with the post, which will provide you with the basics of eCommerce web development, effective approach to the process, its cost and available web building options. Online store creation is a challenging process that requires maximum investment of effort and time. The problem becomes much more complicated, if you don’t have neither time nor experience and knowledge sufficient to cope with the task successfully. 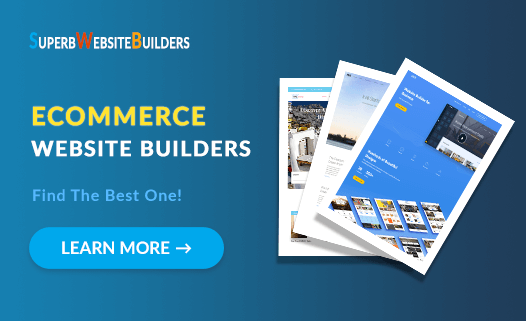 In this case, you won’t go without an effective, affordable and trustworthy web building solution – an eCommerce website builder. There are many online store builders available out there, but you should make a profound search to get the best one, which meets your business requirements and preferences most of all. The right choice will help you save much effort and time in future, thus making it possible to focus on the promotion of your eCommerce website. Let’s review the top10 eCommerce website builders now. Shopify is a specialized eCommerce software, the entire feature set of which is geared towards the development of professional online stores. By using the system, you can design small and medium shops as well as impressive hypermarkets with superior functionality and abundance of shopping options. This eCommerce software might occupy the first position in the list of the best niche platforms, but it may seem somewhat complicated for newbies. Shopify is chock-full of advanced and professional niche-related features. The website builder has its POS (Point-of-Sale) software, which makes it possible to sell products in you retail storefront in the offline mode, managing multiple staff accounts and synchronizing with accounting software if needed. Being initially oriented on building web stores, the system offers a stunning collection of responsive eCommerce templates. There also lots of design customization options and tools you can apply to give the selected themes trusted and professional look. Anyway, web store design is one of the first things a potential customer pays attention to, when reaching the website. What you can do to set it up is to create and update the header, footer, sidebar, show window and shopping cart design, background, style and other important website elements. For experienced users, there is a code editing option and own markup language to create unique web store look. Another Shopify highlight is its integration with external platforms and well-known marketplaces. Thus, you can integrate with Xero, Quickbooks and other accounting software to boost your web store performance. It’s also possible to synchronize your account with that on Amazon to increase your sales volume and generate traffic. Business owners value an opportunity to create the receipts online, view and analyze the sales statistics, control the account balance and utilize other options that help them manage their businesses in the best way possible. The Future Publishing option is the highlight of the system. It allows publishing blog posts, products reviews and catalogue collections that are going to appear on sale in the future. 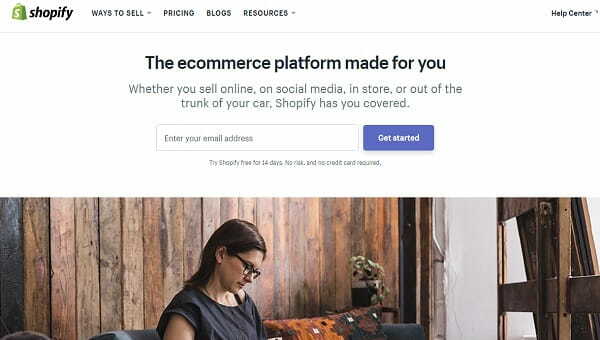 Shopify is a nice eCommerce CMS, which is also optimized for mobile marketing. The range of features and options it offers is quite extensive and each user may choose the required functionality based on the web building skills and expertise rate. The website builder is quite expensive, but its cost is reasonable and is worth the result you will eventually get. Wix is an impressive all-in-one website builder, the feature set and functionality of which make it the best eCommerce web building solution. The service has won worldwide popularity due to its exceptional ease of use, rich template collection and abundance of tools you can use to design an outstanding website. The number of Wix eCommerce subscribers has exceeded 430,000 users living in more than 190 countries. The system has its own eCommerce engine that comes with multiple customizable options. What you can do here is to set up payment and shipping options, create discount coupons, set tax management parameters, design the show window, import/export products, upload and manage product lists etc. Other eCommerce features that should be mentioned here include drag-and-drop website editing options, logically-structured and appealing product galleries, secure shopping process, mobile optimization, 24/7 customer support and what not. With Wix, you can create small-to-medium online stores. Wix comes with lots of quality templates for e-store projects. All of them are versatile and optimized for mobile viewing. This is a must-have feature for a contemporary online store. You will also be able to use the mobile editor to manage the mobile version of your web store without impairing the desktop mode. However, all the changes you make in the desktop version of your web store will be reflected in its mobile mode. That’s very convenient. Wix comes with multilingual support, which makes it possible to launch websites in several language versions to target international customers and business partners. The system also comes with a forum app, which allows adding a forum to your web store to initiate and hold conversations with customers. An advanced Wix ADI tool the system offers allows creating an eCommerce website with ease. Just provide the details of a web store you need (its type, extra features like a blog or a booking option, its name, location) and select among the available options the system offers. What you should do next is to edit your web store info, pick the design you like and follow the tips the Artificial Intelligence generates to customize the project and bring it online. WooCommerce is an open-source official WordPress shopping cart plugin, which makes it possible to launch a CMS-based online store. As of today, more than 350 thousands of web stores have been created with the plugin. It is absolutely free to download and install, but it comes with a set of paid features that simplify the web store management process. All in all, WooCommerce is quite a functional customizable plugin, but it still requires certain web design experience and coding knowledge to make the most out of its use. The service works great for small and medium eCommerce websites. It’s easy to integrate it into any WordPress website to give it the required functionality. As soon as you integrate the plugin, you will see a detailed informative wizard on how to successfully get started with your online store development. WooCommerce grants an opportunity to use a set of out-of-the-box features and add extensions to your website. With WooCommerce, you can create product catalogues, set up categories and search filter options, control the process of user registration, accept orders and online payments, keep track of your sales statistics and visitors’ behaviour by using integrated and external analytics tools, set up payment, tax and shipping details as well as boost user loyalty by means of organizing mailouts. Even though, WooCommerce is a free plugin, it still implies the necessity to buy hosting for your eCommerce website. If you decide to give it a try, it’s reasonable to go for the official WordPress hosting – Bluehost. This is one of the undeniable niche leaders, which currently powers over 5 millions websites across the globe. This WordPress hosting offers multiple features and advantages, including ease of use, decent customer support, security, flawless performance, multiple scripts, rich marketplace, unique WordPress-focused features, SEO tools, DDOS protection, IP blacklist, Site Access Blockage tool etc. A free domain registration and a pre-installed CMS WordPress are included to every Bluehost plan. Weebly – is one of the oldest representatives of the eCommerce web building niche. Launched in 2006 and having lived through multiple transformations, the service offers a powerful feature set needed to set up and manage a quality online store. The system used to be an all-in-one website builder, but after the acquisition by Square in 2018, it has gained a straight eCommerce-oriented focus. It works well for building small-to-large online stores, offering convenient drag-and-drop functionality and intuitive interface. Among the features that can contribute to your website performance, it makes sense to mention safe payment options, integrated shopping cart, simple product upload and management, order and product tracking etc. • Cost – $8 to $38. The service makes it possible to upload products from CSV files. This is especially useful, when it comes to boosting the speed of uploading/adding products to the website. Email marketing feature will help keep your customers aware of all the events, updates, news and special offers they can avail when visiting your Weebly-based online store. The search filter option Weebly provides makes it simpler for users to explore the product assortment and select the required items, sorting them out by crucial parameters such as type, color palette, size, dimensions, cost and what not. Weebly offers a stunning collection of responsive eCommerce designs, which are 100% customizable and can easily adapt to desktop and mobile screens. You can also upload your own template, having created it yourself or having bought it from third-party developers. 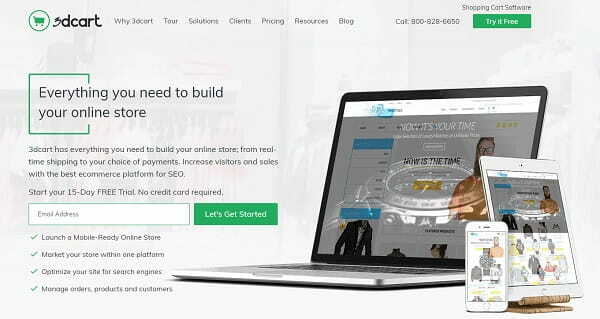 BigCommerce is another powerful specialized eCommerce website builder. The system allows building websites for small, medium and large sales-oriented businesses. Its functionality and design customization tools are above the average, which makes the service a decent competitor in the eCommerce web building niche. BigCommerce offers all the available eCommerce niche options. It allows trading at multiple platforms as well as via Facebook. You can also set up the automated email marketing tool, create and manage the inventory list, organize product exchange/return processes, design ad banners, assign product parameters and specifications, create discounts and gift certificates etc. Product export/import option via the use of CSV files is enabled here as well. • Cost – $29.95 to $249.95/mo. BigCommerce makes it possible to integrate with powerful eCommerce applications for better web store performance. The platform has an industry-leading selection of integrations, all of which are curated to ensure the best eCommerce web building experience. You can select and connect any of them to your store to start selling effectively. These include marketing and conversion apps (HubSpot, Google AdWords, A/B testing suites like Optimizely etc. ), shipping applications (ShipperHQ, Ordoro, Endicia, ShipStation and ShippingEasy), ERP integrations to enhance the efficacy of your operations (NetSuite, Brightpearl and Microsoft Dynamics), CRM apps (Salesforce, NetSuite and Zoho), API and accounting tools etc. The website builder has over 100 responsive templates. Most of them are paid, but the cost is worth the quality of themes. The designs are sorted out by categories for quick and easy search. Code editing option is not provided here, but this is not a problem for the prevailing amount of users, who have the only goal in mind – to launch a decent selling eCommerce website. BigCommerce works great for this purpose. Volusion is an eCommerce website builder, which cannot boast such popularity as Wix, Shopify or BigCommerce, but still allows creating decent online stores. This all-in-one service is safe, effective and quite understandable. The range of features it involves is extensive and presents such parameters as SEO optimization, marketing and sales options, multi-channel integration, eCommerce tools, SSL Certificate connection, CRM system and more. It ensures safe transactions, reliable PCI certification, 24/7 live support, anti-scam protection and other features users value a lot. Among the most widespread and important eCommerce tools, it makes sense to mention Barcode Generator, extensive inventory list, CSV file product import and advanced inventory management system. What’s more, the website builder comes with a list of eCommerce tools, which can improve your web store performance with ease. These are special vendor codes, advanced recovery tools, warehouses set up, versatile pricing options, shipping and tax rate calculator, simple order processing, professional currency tools, customer-account management, bot captcha tool, drop shipping integration and more. Entrepreneurs, who are always in a hurry, can install the Volusion mobile application to be able to manage and update their web stores anytime and anywhere. Volusion does not offer multiple eCommerce templates. As of today, their number somewhat exceeds 40 themes, which are responsive and come with standard (WYSIWYG) and advanced (CSS/HTML) code editing options. All in all, Volusion is a decent representative of the eCommerce web building niche. Its feature set, versatility of templates, marketing and web building tools and other characteristics make the system a worthy choice. The list of eCommerce software is incomplete without 3dcart. The customer base of the service is not as extensive as that of the renowned niche leaders, but the system is still quite perspective. The developers of the platform keep working on the improvement of quality of web stores launched with the service. The feature set of 3dcart is more than enough to launch an impressive online store. The platform is module-based and it offers out-of-the-box integrations for maximum user convenience. The website builder abounds in marketing and SEO tools. It offers CRM integration, blogging option, automated mailout, reporting feature, user groups creation and other stunning features website owners will eagerly use. When working with 3dcart, you can additionally make use of product import/export feature, variety of payment and shipping options, warehouse stock product charts, sales statistics tools. Integration with social network services is also supported here. One of the highlights of the system is its amazing collection of modules you can choose and integrate into your website. These are Facebook Ads/Connect, Zapier, Group Deals, AWeber, MailChimp, RSS Feeds, LiveChat, Saved Carts, Wish List, POS, AutoResponder and eBay to mention a few. 3dcart also offers advanced product management and blogging options, marketing tools (integrated shopping plugins), sales and analytics system, SEO options and security parameters. It also has a collection of quality responsive niche templates (there are over 70 of them here) you can customize and switch while working on your website development. These are the major features that make 3dcart a worthy choice for eCommerce web building goals. Squarespace is a pretty nice choice for users willing to launch and manage a quality eCommerce website. The system mostly works well for the development of online stores for artists and designers. It especially works well for users, who have an idea to present their products in the most favorable light. To let you do that, the system allows creating an appealing show window to display the product range to the advantage. It is possible to create impressive product show windows to add and customize the items you plan to offer for sale. You will be able to manage product prices, add videos, galleries, product variations (SKUs), adjust payment and shipping options, implement loyalty programs for returning customers etc. As to the template gallery, Squarespace doesn’t offer multiple themes. It currently has over 40 designs, the quality of which is above the average. eCommerce functionality can be applied to all the templates. Bookmark is a cloud-based AI-powered website builder, which works great for the development of small and mid-sized online stores. The system will be a nice choice for inexperienced users, who are not aware of the intricacies of the web building process, but have an intention to design a decent eCommerce website. Likewise, it will be a great choice for web designers, who are involved in the development of web stores for clients. Bookmark offers an eCommerce module to promote your online store with maximum efficacy. Apart from that, the system lets you choose between eCommerce modules you can add to your online store to boost its performance and customer engagement rate. These modules can be compared to widgets in terms of functionality. These are titles, texts, links, quotes, dividers, HTML code insertions, contact and feedback forms, slide shows, galleries, audio/video elements, social network buttons etc. Jimdo is another sample of a decent and easy to use website builder, which uses the AI tool. Jimdo Dolphin automatically creates an eCommerce website for you, using information you will provide upon the system’s request. Dolphin will ask business-related questions you should answer to let it build a website for your online store. If you do everything right, you will eventually get a ready-made website in less than 5 minutes. Further customization may take some time, which depends upon the degree of website customization and your web design skills. There is no need to create website layout, design and structure – the system does that for you. If you still wish to build an eCommerce website without the Artificial Intelligence, you can do that in the classic Jimdo Editor. To do that, you should select the best template from the extensive design collection the system offers, add your logo and background, edit fonts and colour palette and go for the selection of customization tools to give your website the desired look and performance. If you are right about to launch an online store, using an eCommerce website builder is definitely a smart choice. These services feature the best combination of convenience, simplicity and advanced functionality. eCommerce websites created with these platforms, look appealing and reveal top notch performance. And you don’t have to be the master of coding to reach this result. Shopify is the eCommerce software, which ranks second in the list of the world-popular platforms used to launch online stores. It’s strong eCommerce focus, marketing, promotion and product management tools have made the system the renowned leader in the web building market. Wix is currently the best website builder to create and manage top notch online stores. Extensive collection of eCommerce templates, versatility of niche-specific features, multilingual support and multiple apps bring the functionality of the system to the professional level. WooCommerce is an advanced shopping cart plugin, which was initially created for WordPress.The plugin makes it possible to launch a CMS-based web store, using extensive web design customization options included. Weebly – is the eCommerce focused website builder, which is known for its distinctive feature set, niche templates and customization tools required to launch and manage online stores without any programming skills required. BigCommerce is a decent representative of the eCommerce web building niche, which is known for its extensive template collection and powerful external integration options for better web store performance. Volusion is an all-in-one service, which provides an impressive selection of eCommerce tools, features and integrations needed to launch a decent online store. Powerful built-in CRM and statistic system give you full control over your web-store. 3dcart is a module-based eCommerce web building platform, which is rich in web store creation and content management. Due to rich integration options, you can enlarge your sales via external channels like Facebook, Amazon or MailChimp. Squarespace is a website builder, which works well for the development of eCommerce websites for creatives. The system allows creating appealing product show windows and adjusting the settings to drive user attention and boost sales volume. Bookmark is a cloud-based website builder, which is powered by the Artificial Intelligence technology. 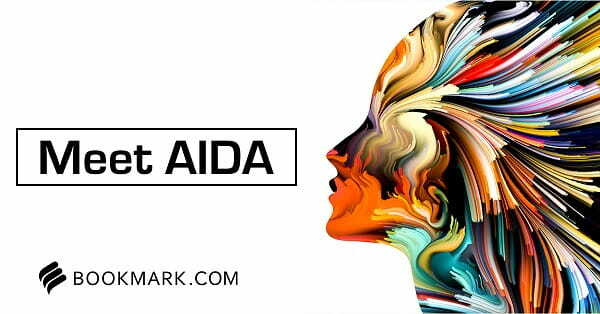 The system is known for its AIDA Assistant, which uses the submitted information to automatically create a decent eCommerce website. Jimdo is another sample of a quality website builder, which allows choosing between two modes – AI-based Jimdo Dolphin and Classic Style Editor – to launch a decent eCommerce website. Web stores created with the system have appealing look and impressive performance, which appeals to users and encourages them to explore the service. The choice of the best eCommerce website builder generally goes down to your web building needs and aspirations. To decide, which of them, however, works best for your particular project, take your time to test all the platforms. This will give you the idea of the best solution you should eventually go for.